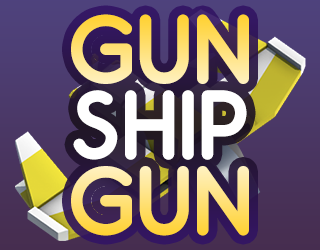 As much of the game as possible reuses the gun mechanic in multiple ways - Guns serve as Artillery and Thrusters, the only kind of score and the primary method of progression. The only issue I had was knowing whether the weapon I was picking up would replace my back weapon, or my main weapon. I never really wanted the shotgun, so I'd try to swap it for the rail or machine gun, and it seemed inconsistent as to which of my weapons would get replaced. Other than that, the game is really well polished and was fun to play. It was cool to see a Game Jam game that actually had an ending to it. I liked your final message too. Good job! It triiiiies to replace the weapon with the least ammo, but it's a little bugged. Because the Rail Gun has a Max ammo of 20 or so and others have a max of 100, the Rail gun will often be immediately replaced! Boo indeed! If I go back to it, it needs to replace weapons based on relative remaining ammo rather than absolute. I liked the boss battle against the donut/banana at the end. The shotgun's shot radius was cool and the railgun was awesome because it's overpowered. Overall very nice and the feel was right just needs some tweaking here and there. Too easy though. Didn't struggle at all. A lot of people agree, including me! The railgun is awesome and the game is too easy. I ran out of time for play testing so I figured I'd play it safe, backfired (pun intended) a little! Nice game. I like the speed of everything and the movement of the ship. It feels just right. Some points how you could improve this game: A little bit harder. In my opinion it was too easy and because every enemy is the same, the player don't need to switch between the weapons. More enemies with different attack patterns would be great. 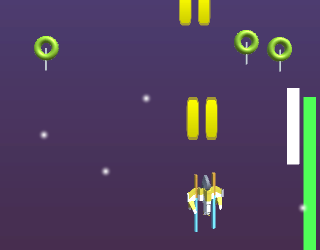 Yeah, if I had time to add anything it'd be an extra weapon and more enemies, or at least more enemy patterns.